The Coca-Cola Games 800m heats is currently underway at the ANZ Stadium along with the finals of the junior girls high jump, senior boys shot put, senior girls long jump, intermediate boys discus and intermediate girls triple jump. Thirteen gold medals are up for grabs in Day 1 of competition. 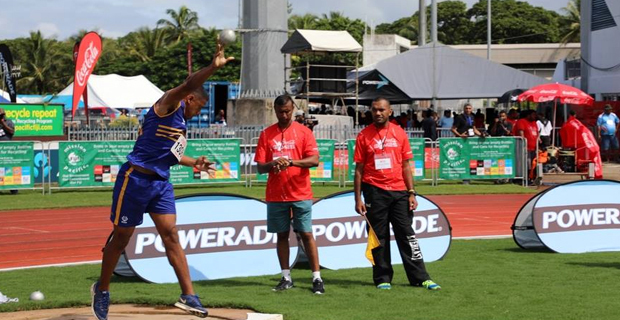 While speaking at the opening of the Coca-Cola Games this morning, Permanent Secretary for the Ministry of Youth and Sports, Maretino Nemani congratulated all the athletes who have qualified to be part of Fiji’s biggest, best and fiercely contested secondary schools athletics meets of all time. He highlighted that sports may be considered as nothing more than just fun and games but they have played a role in our society and in the development of individuals. Nemani also encouraged all participating schools to practice good sportsmanship during the three day competition and urged athletes to give it their best shot in the various events they will be competing in this year. In other events today, the girls 1500 metres will start at 4.18pm, The heats of the 100 metres will start at 10.58am today. The 400 metres heats will also be held today at 1.38pm.